Background and Aims: AIDS (acquired immune deficient syndrome), a deadly human infectious disease is caused by HIV (human immunodeficiency viruses) infection. Patient’s mortality was eventually reduced to one-fourth by combined chemotherapy (usually 3 chemical drugs simultaneously) than earlier HIV/AIDS treatments (single drug or vaccine) in the clinic. Results: Combined treatments against HIV/AIDS are still incurable for all patients despite a high rate of patient’s survival. Basic viral pathological study and advancing drug development systems for curable medications are indispensable nowadays and in the future. Conclusion: Up to date, therapeutic trinity (combined therapy) against HIV/AIDS is generally among chemical drugs. 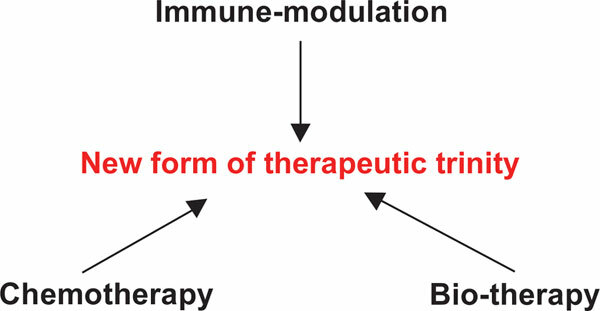 In this article, several forms of other therapeutic attempts for effectively curing efforts against HIV/AIDS are proposed-including the development of next generation therapeutic HIV vaccines and schedules, new categories of bio-therapy, different pathways of immune-modulation, herbal medicines in general (allopathic, Ayurveda and traditional Chinese medicines), high quality of physical exercises, and especially therapeutic combinations guided by latest medical discovery and principles (new forms of therapeutic trinity against HIV-induced pathogenesis and human mortality). HIV therapy, herbal therapy, drug combination, biotherapy, chemotherapy, phytochemistry, antibody, interferon, cytokine, immunotherapy, personalized medicine.